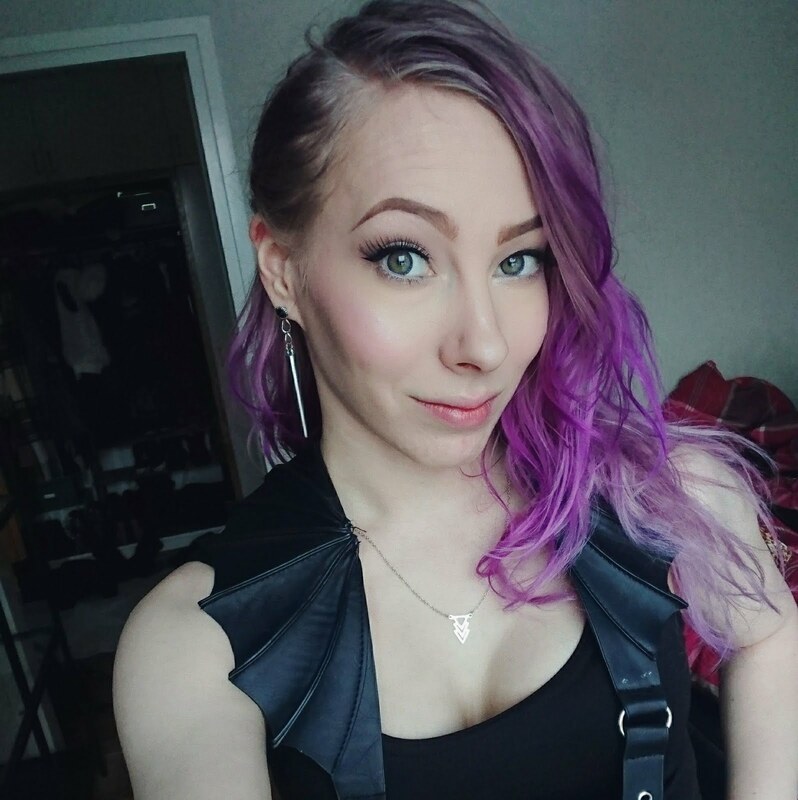 As promised in previous post, this one is up quicker than the outfit one was. I need to catch up a tiny bit if I want to get all the posts I planned up for you all to read. But to be honest, I don't mind a bit of pressure, it just makes me perform better. With every task in general. Is any of you the same way? 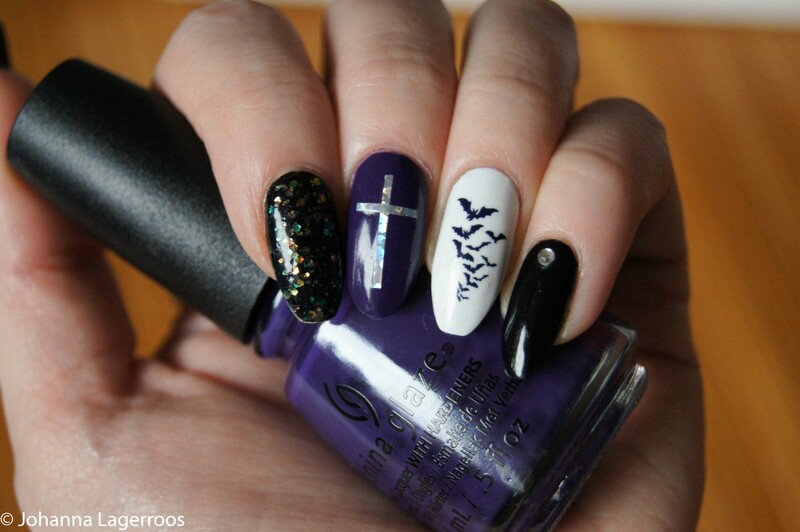 Today, I wanted to show you another Halloween inspired nail art. I'll be doing quite a bit of these because they are easy to do and photograph, and they're almost as fun as making up costumes. And speaking of costumes, I'm getting parts for one in particular this week so hopefully I can shoot that in the weekend. Also, I'm getting up on before that once I buy one more thing for it. 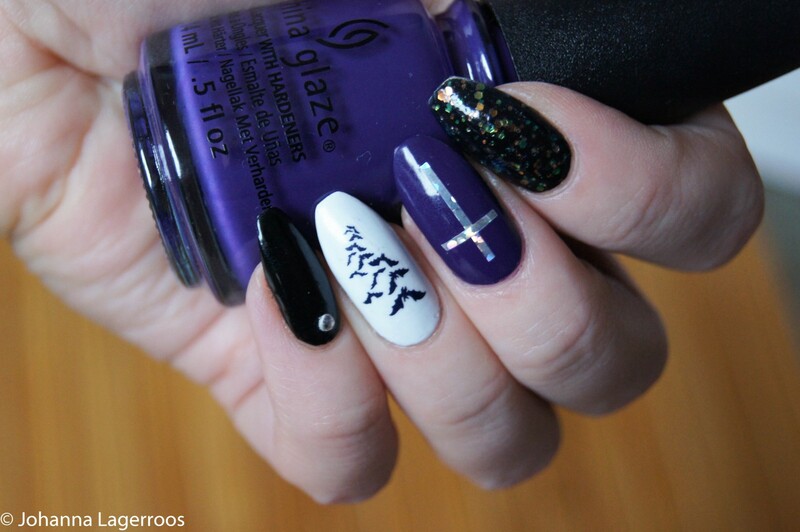 These nails were inspired by the bat water decals I got from Shop Keeki (get yours here). I wanted to do them over white background and then planned the rest around that. 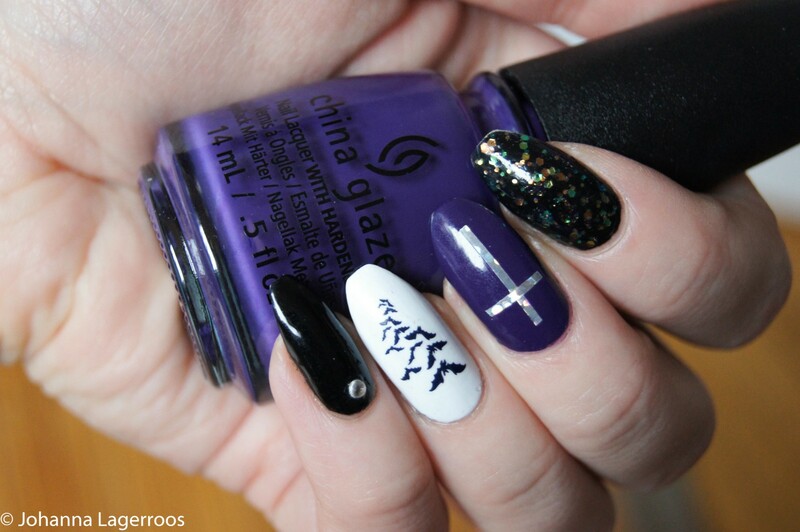 I chose purple and black as my main colours - mostly because I wanted to try the new shade of purple out - and then tried to pick appropriate designs for the rest of the nails. My aim was to make simple but fun design that would have some girliness and glitter to it despite being quite Halloween themed. I feel like I actually succeeded in that, and I've been really loving this mani for now. Although today (on the day this post will be up) I really need to change it up so that I'll get content for an upcoming post. I think I actually have an idea in mind already too. 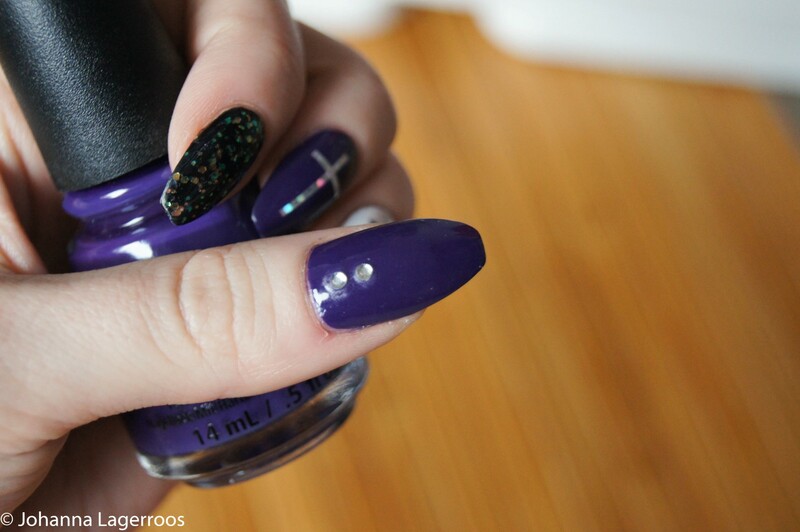 The polish that I really wanted to showcase in this mani was this awesome purple. It's China Glaze Dawn of the New Reign, and it's from this Fall's Street Regal collection. I really love this shade because it's dark, but it's not the generic plum shade that usually comes up in every other Fall collection I feel. It's more blue-toned and brighter, which in my mind fits perfectly for a fun Halloween mani. For the design, I simply used some clear rhinestones - fun addition to basically any mani, a little silver holo striping tape for the crosses and of course some glitter polish on the index finger. This was the kind of mani where less really felt more and I'm so happy I kept this simple. It also means that anyone of you can recreate this at home because it really doesn't require that much. The polishes I used for this look were all by China Glaze. The shades used are called Dawn of the New Reign, Liquid Leather, White Out and the glitter polish is Moonlight The Night. I must say that the glitter polish is pretty magical. It's purple and blue and all that in a bottle and over light shades, but once you put it over dark polish, it turns the glitter orange and teal. That kind of witchcraft is so appropriate for Halloween time. 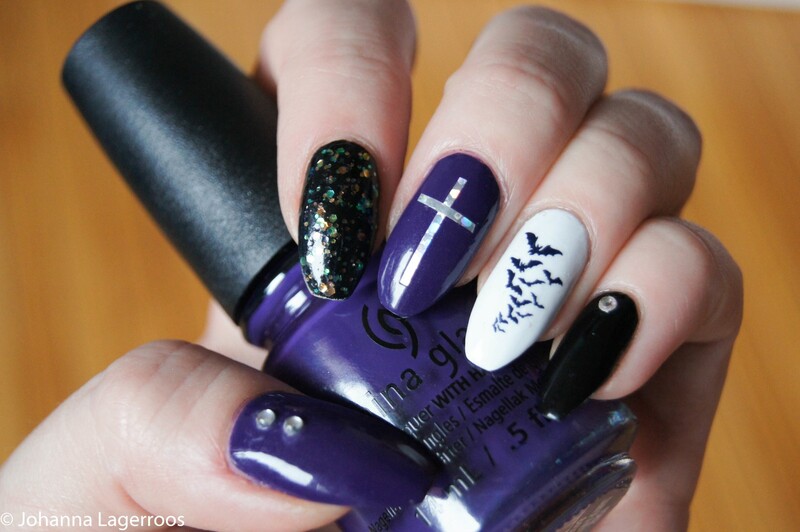 What do you think about these nails? Let me know in the comments below! Next time, I hope I'll have a costume to show you, and I try to get it up in a couple of days. Depending on how soon I can track down an accessory that really makes the look. So stay tuned for that and follow me in Instagram for more makeup looks and outfits. I will try to get back to outfit posts this Fall/Winter, once I get through Halloween and convince my boyfriend to take my pictures. I'll see you all in my next post! Perfect nail art for your long nails!